The size of the overwintering monarch population in Mexico is usually released in late January or February. Early reporting helps all of us plan for the season ahead. Unfortunately, for reasons that are not clear, this report wasn’t released to the press until the 15th of March – at the end of the season and a week after the first monarchs from Mexico had made their appearance in Texas. The total for all colonies, as reported to the press, is 2.89 hectares. There is good news and bad news in this number. The good news is that the population was larger, by almost a hectare, than I expected. The bad news is that this number represents the 4th lowest total for the monarch colonies recorded since the winter of 1994-1995. Further, this population represents a continuation of a trend – the 8th consecutive population below the long term average. 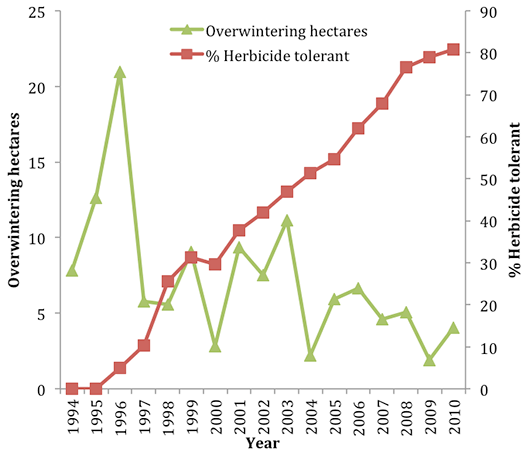 The figure below represents the total number of hectares of monarchs at the overwintering sites in Mexico from 1994 through the winter of 2011-2012*. Two averages are indicated – the long-term average that incorporates measures for all years (X=6.99) and an average for 2004 to present (x=4.16). 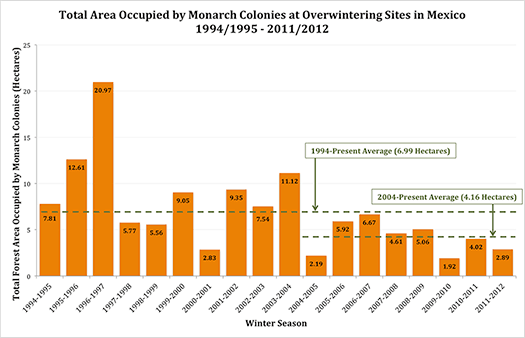 It is apparent that there has been a significant decline in the overwintering monarch population since 2003. This decline is related to the adoption of herbicide tolerant row crops that were first introduced in 1996. As pointed out in previous communications, the milkweeds in these row crops were shown in 2000 to produce more monarchs per unit area than other monarch habitats. By 2004 the adoption of corn and soybeans genetically modified to resist glyphosate exceeded 51%. The adoption rate by 2010 was 81% (see figure**). Milkweeds are now scarce in this formerly productive habitat. Overall, the amount of habitat lost due to the adoption of these crops may exceed 100 million acres. These losses combined with the annual loss of habitat of 2 million acres, the overuse of herbicides and mowing, the reduction of conservation reserve program (CRP) acreage and the increasing conversion of pastures and grasslands to corn and soybeans for the production of biofuels point to a continuing decline in monarch numbers in the years ahead. The question I’m wrestling with is: how can we make this happen? How can the monarch community engage and inform the public and the decision makers of the necessity of restoring milkweeds to save the monarch migration. Our Monarch Waystation and the Bring Back the Monarchs programs, or their facsimile, need to be broadly adopted. We need a national campaign to restore habitats for monarchs. * The areas of the monarch overwintering colonies are measured several times during the winter. Because the sizes of the colonies increase as the season progresses from mid November to mid December and vary with temperatures, the areas obtained in mid December, a period with relatively low temperatures and little flight, are used to represent the population. Over the period from 1994 to the present, the assessment of colony sizes has been conducted by two organizations, the Monarch Butterfly Biosphere Reserve (MBBR) and World Wildlife Fund Mexico (WWFM). The MBBR teams were led by Eligio Garcia Serrano. Since 2004, Eduardo Rendon has led the monitoring teams supported by WWFM cialis. The monitoring by these teams over the years is much appreciated. Without their hard work our understanding of the factors that determine monarch numbers from year to year would be poor indeed. ** Thanks to Janis Lentz for creating this figure. I know it may not seem like much….but what if all us Monarch enthusiasts, just pick a piece of open land and spread seeds, allow the milkweed to come back to where it may?? With all the social networking, perhaps we could gain in small ways that would help! And the beat goes on. Taylor Garden Club members have been discussing GMO crops since September, 2011. According to several articles and films I have read or watched, the creator of Round-Up & Round-Up ready seeds is Monsanto. Former Monsanto employees currently hold key decision-making appointed positions in Washington, DC. It’s no wonder Round-Up ready seeds are deemed safe by our government officials while we, average citizens, are seeing the tragic truth. If GMO crops are killing insects what might it be doing to us? To hear that there were more Monarchs than expected was indeed good news. Here in northern Michigan we are having an unexpected early spring. I will be planting and spreading seeds as I always do. This will be the 39th year that our family has raised and set free Monarchs. I hope my grandchildren will be able to do this with their grandchildren years from now. The GMo crops have certainly raised questions about what the future will hold. I will encourage others to spread seeds. One way to make up for some of the milkweed lost in row crops is to better manage Conservation Reserve Program (CRP) land for pollinators. Most CRP fields are sod bound and contain few milkweeds or other flowers. Renovating these acres could add millions of acres of productive habitat. And just a question, is the thing we should be worried about acreage, or milkweed numbers, in effect would creating high density milkweed plantings making up for large acreages with relatively few milkweeds as row crops were even before GMO corn and soybeans. It seems to me that at least 3 things will be necessary to produce a significant increase in milkweed plant availability. 1. Ready availability of plant seed. 3. PR program that creates widespread concern for survival of the butterfly, in both Mexico and the U.S., aimed not only at landowners and butterfly aficionadoes but also the general public, particularly children. Who should do these things, how and the source(s) of funding, it seems to me, are the practical questions to be solved. Saw our first monarch June 14,2012 in Thermopolis, Wy. It was a female and loved our alternafolia butterfly bush which is in full bloom. this is the earliest we have seen monarchs here in the last 10 years. Last year we didn’t see any until September. I saw my first female monarch on July 1st here in Somerset, MA. I have a milkweed patch in my backyard that I have been cultivating for four years now and I am so happy to see a major increase in the number of plants that have sprouted this summer. I am presently rearing twelve caterpillars in my house and this is not even the migrating generation! That generation will mature and fly in mid-September here in southeastern New England. I think individual property owners can contribute greatly to the success of the Monarchs by establishing a milkweed patch on their property. It really is like the movie, “Field of Dreams”. If you plant it (milkweed) they will come! !